Dennis Dlugos, MD, is a pediatric neurologist at Children's Hospital of Philadelphia. He holds the Catherine D. Brown Endowed Chair in Pediatric Epilepsy. 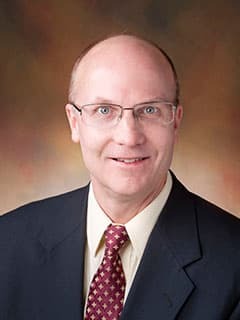 Dennis J. Dlugos, MD, MSCE, is a professor of neurology and pediatrics at Children’s Hospital of Philadelphia (CHOP) and the University of Pennsylvania School of Medicine. He is Director of the Section of Clinical Neurophysiology and the Epilepsy/Clinical Neurophysiology Fellowship. He holds the Catherine D. Brown Endowed Chair in Pediatric Epilepsy. Dr. Dlugos obtained his medical degree at Columbia University College of Physician and Surgeons in 1988, and a Master of Science Degree in Clinical Epidemiology (MSCE) from the Center for Clinical Epidemiology and Biostatistics, University of Pennsylvania School of Medicine in 2002. He completed an internship in Pediatrics at the National Naval Medical Center in Bethesda, Maryland, in 1989, and served as an Undersea Medical Officer in the U.S. Navy from 1989 to 1993. He then completed a residency in Pediatrics at Thomas Jefferson University and Alfred I. duPont Institute in Philadelphia, Pennsylvania, and Wilmington, Delaware. Dr. Dlugos then completed a residency in Neurology/Child Neurology and a fellowship in Epilepsy and Clinical Neurophysiology at the University of Pennsylvania Medical Center and The Children’s Hospital of Philadelphia. Dr. Dlugos is board certified in Neurology with special qualifications in Child Neurology, Pediatrics, Clinical Neurophysiology, and Clinical Neurophysiology with special qualifications in Epilepsy Monitoring. Dr. Dlugos is a co-investigator on NIH grants involving epilepsy genetics, pharmacogenetics, and epilepsy surgery. Dr. Dlugos is course director of Brain and Behavior, a 9-week Clinical Neuroscience course in the University of Pennsylvania School of Medicine curriculum. Dr. Dlugos is a member of the American Academy of Pediatrics, the American Academy of Neurology, the American Epilepsy Society, the American Clinical Neurophysiology Society, and the Child Neurology Society. Dr. Dlugos is a frequent lecturer locally and at national medical meetings on topics related to pediatric neurology, epilepsy, and electroencephalograms. He has published papers in journals such as Neurology, Epilepsia, Archives of Neurology, Pediatric Neurology, and Journal of Child Neurology. Kim H, Kim SY, Lim BC, Hwang H, Chae JH, Choi J, Kim KJ, Dlugos DJ. Spike persistence and normalization in benign epilepsy with centrotemporal spikes - Implications for management. Brain Dev. 2018 May 10. pii: S0387-7604(18)30184-0. Halford JJ, Sperling MR, Nair DR, Dlugos DJ, Tatum WO, Harvey J, French JA, Pollard JR, Faught E, Noe KH, Henry TR, Jetter GM, Lie OV, Morgan LC, Girouard MR, Cardenas DP, Whitmire LE, Cavazos JE. Detection of generalized tonic-clonic seizures using surface electromyographic monitoring. Epilepsia. 2017 Nov;58(11):1861-1869.
von Spiczak S, Helbig KL, Shinde DN, Huether R, Pendziwiat M, Lourenço C, Nunes ME, Sarco DP, Kaplan RA, Dlugos DJ, Kirsch H, Slavotinek A, Cilio MR, Cervenka MC, Cohen JS, McClellan R, Fatemi A, Yuen A, Sagawa Y, Littlejohn R, McLean SD, Hernandez-Hernandez L, Maher B, Møller RS, Palmer E, Lawson JA, Campbell CA, Joshi CN, Kolbe DL, Hollingsworth G, Neubauer BA, Muhle H, Stephani U, Scheffer IE, Pena SDJ, Sisodiya SM, Helbig I; Epi4K Consortium; EuroEPINOMICS-RES NLES Working Group. DNM1 encephalopathy: A new disease of vesicle fission. Neurology. 2017 Jul 25;89(4):385-394. Lin JJ, Banwell BL, Berg RA, Dlugos DJ, Ichord RN, Kilbaugh TJ, Kirsch RE, Kirschen MP, Licht DJ, Massey SL, Naim MY, Rintoul NE, Topjian AA, Abend NS. Electrographic Seizures in Children and Neonates Undergoing Extracorporeal Membrane Oxygenation. Pediatr Crit Care Med. 2017 Mar;18(3):249-257. Lemke JR, Geider K, Helbig KL, Heyne HO, Schütz H, Hentschel J, Courage C, Depienne C, Nava C, Heron D, Møller RS, Hjalgrim H, Lal D, Neubauer BA, Nürnberg P, Thiele H, Kurlemann G, Arnold GL, Bhambhani V, Bartholdi D, Pedurupillay CR, Misceo D, Frengen E, Strømme P, Dlugos DJ, Doherty ES, Bijlsma EK, Ruivenkamp CA, Hoffer MJ, Goldstein A, Rajan DS, Narayanan V, Ramsey K, Belnap N, Schrauwen I, Richholt R, Koeleman BP, Sá J, Mendonça C, de Kovel CG, Weckhuysen S, Hardies K, De Jonghe P, De Meirleir L, Milh M, Badens C, Lebrun M, Busa T, Francannet C, Piton A, Riesch E, Biskup S, Vogt H, Dorn T, Helbig I, Michaud JL, Laube B, Syrbe S. Delineating the GRIN1 phenotypic spectrum: A distinct genetic NMDA receptor encephalopathy. Neurology. 2016 Jun 7;86(23):2171-8. Topjian AA, Sánchez SM, Shults J, Berg RA, Dlugos DJ, Abend NS. Early Electroencephalographic Background Features Predict Outcomes in Children Resuscitated From Cardiac Arrest. Pediatr Crit Care Med. 2016 Jun;17(6):547-57. Dlugos DJ. The nature of neonatal status epilepticus--a clinician's perspective. Epilepsy Behav. 2015 Aug;49:88-9. Abend NS, Wagenman KL, Blake TP, Schultheis MT, Radcliffe J, Berg RA, Topjian AA, Dlugos DJ. Electrographic status epilepticus and neurobehavioral outcomes in critically ill children. Epilepsy Behav. 2015 Aug;49:238-44. Kessler SK, McCarthy A, Cnaan A, Dlugos DJ. Retention rates of rufinamide in pediatric epilepsy patients with and without Lennox-Gastaut Syndrome. Epilepsy Res. 2015 May;112:18-26. Topjian AA, Fry M, Jawad AF, Herman ST, Nadkarni VM, Ichord R, Berg RA, Dlugos DJ, Abend NS. Detection of electrographic seizures by critical care providers using color density spectral array after cardiac arrest is feasible. Pediatr Crit Care Med. 2015 Jun;16(5):461-7. Bearden D, Steenhoff AP, Dlugos DJ, Kolson D, Mehta P, Kessler S, Lowenthal E, Monokwane B, Anabwani G, Bisson GP. Early antiretroviral therapy is protective against epilepsy in children with human immunodeficiency virus infection in botswana. J Acquir Immune Defic Syndr. 2015 Jun 1;69(2):193-9. Yang A, Arndt DH, Berg RA, Carpenter JL, Chapman KE, Dlugos DJ, Gallentine WB, Giza CC, Goldstein JL, Hahn CD, Lerner JT, Loddenkemper T, Matsumoto JH, Nash KB, Payne ET, Sánchez Fernández I, Shults J, Topjian AA, Williams K, Wusthoff CJ, Abend NS. Development and validation of a seizure prediction model in critically ill children. Seizure. 2015 Feb;25:104-11. Abend NS, Dlugos DJ, Zhu X, Schwartz ES. Utility of CT-compatible EEG electrodes in critically ill children. Pediatr Radiol. 2015 Apr;45(5):714-8. Abend NS, Bearden D, Helbig I, McGuire J, Narula S, Panzer JA, Topjian A, Dlugos DJ. Status epilepticus and refractory status epilepticus management. Semin Pediatr Neurol. 2014 Dec;21(4):263-74. Connolly B, Matykiewicz P, Bretonnel Cohen K, Standridge SM, Glauser TA, Dlugos DJ, Koh S, Tham E, Pestian J. Assessing the similarity of surface linguistic features related to epilepsy across pediatric hospitals. J Am Med Inform Assoc. 2014 Sep-Oct;21(5):866-70. Milligan CJ, Li M, Gazina EV, Heron SE, Nair U, Trager C, Reid CA, Venkat A, Younkin DP, Dlugos DJ, Petrovski S, Goldstein DB, Dibbens LM, Scheffer IE, Berkovic SF, Petrou S. KCNT1 gain of function in 2 epilepsy phenotypes is reversed by quinidine. Ann Neurol. 2014 Apr;75(4):581-90. Wagenman KL, Blake TP, Sanchez SM, Schultheis MT, Radcliffe J, Berg RA, Dlugos DJ, Topjian AA, Abend NS. Electrographic status epilepticus and long-term outcome in critically ill children. Neurology. 2014 Feb 4;82(5):396-404. Sánchez Fernández I, Abend NS, Arndt DH, Carpenter JL, Chapman KE, Cornett KM, Dlugos DJ, Gallentine WB, Giza CC, Goldstein JL, Hahn CD, Lerner JT, Matsumoto JH, McBain K, Nash KB, Payne E, Sánchez SM, Williams K, Loddenkemper T. Electrographic seizures after convulsive status epilepticus in children and young adults: a retrospective multicenter study. J Pediatr. 2014 Feb;164(2):339-46.e1-2. Bearden D, Strong A, Ehnot J, DiGiovine M, Dlugos D, Goldberg EM. Targeted treatment of migrating partial seizures of infancy with quinidine. Ann Neurol. 2014;76(3):457-461. Dlugos D. Management of Pediatric Focal Epilepsy. American Epilepsy Society Annual Meeting, Dec. 2017, Washington, D.C.
Dlugos D. Empiricism in Seizure Therapy Development. American Epilepsy Society Annual Meeting, Dec. 2017, Washington, D.C.